Henkel’s stand at The Big 5. 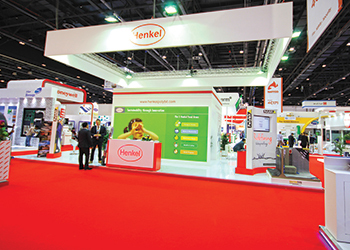 Henkel Polybit Industries (HPIL), a market leader in the field of waterproofing and construction chemical products in the GCC, launched an upgraded version of its Watertite system at The Big 5 show, which was held last November, in Dubai, UAE. The system is claimed to be an innovative waterproofing concept derived from HPIL’s vast knowledge and experience in the production and development of bituminous waterproofing membranes and coatings in the region. “The Watertite system is a unique concept that provides a different dimension to the world of waterproofing. Each system designed under this concept has its specific benefits, thus ensuring the safest and most efficient waterproofing solution,” said Naveen Antony, general manager – sales and marketing at HPIL. Henkel Polybit also used The Big 5 platform to emphasise its ongoing efforts to expand its retail operations. “We believe this launch will be beneficial for smaller contractors, applicators and even individual home owners who are interested in DIY (do it yourself) renovations and waterproofing,” said Antony. “Now a wide range of HPIL products is available on retail shelves, making it easier to access and use the products on a smaller scale. The technical services team is available at all times to provide support and ensure proper application of the products,” he added. At the event, the company also launched Polyscreed, a polyurethane cement-based heavy-duty, durable flooring system, which is resistant to low and high temperatures. As a part of its global campaign on sustainability, HPIL devoted a part of its stand and discussions to its ‘Think Sustainably – Act Sustainably’ maxim, assuring its customers of its commitment to leadership in sustainability as one of its core corporate values. Spread across the Gulf region with offices in the UAE, Saudi Arabia, Qatar, Oman, Bahrain and Kuwait, HPIL has a global network of technical experts from the Henkel Group who cater to and fulfil the requirements of the leading engineering consultants, architects and construction authorities in the region.